If you’re looking for a hit of colour (and really, at this time of year, who isn’t?) 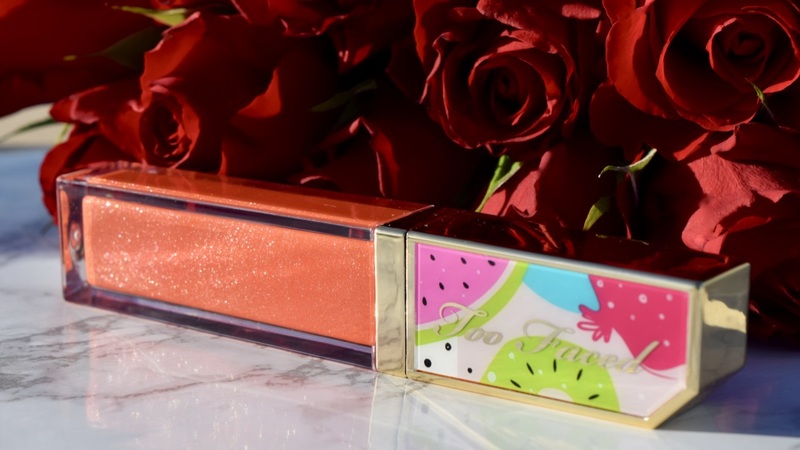 Too Faced have released their Tutti Frutti collection, and honestly, it couldn’t be more fun. Filled with colour and sparkle, it’s a surprisingly thorough range with everything from lipgloss and eyeshadows to highlighting drops and palettes. The Fruits Comfort Lip Glaze comes in an impressive 12 shades, and Takes Two to Mango is a stunning sparkly orange, which is begging to be worn on an evening out. More unexpected than a red lip, orange always feels like a fresher, fun alternative, and it never looks better than when paired with a glowy, bronzed makeup look. Too Faced’s Comfort Lip Glazes are a beautifully glossy formula, and surprisingly well pigmented. A single swipe with the doe foot applicator gives an opaque wash of colour – and I am just obsessed with the golden twinkles in the formula! The formula feels gorgeous to wear, and there’s a fresh, fruity scent too! Too Faced Juicy Fruits Comfort Lip Glaze in Takes Two to Mango is priced at £16 and is available here.